Decorate praying the growth and well-being of the boy, it is the dolls of good luck. Dolls of ceramic price also size is also affordable, it is also suitable for private use for gifts that full-hearted. 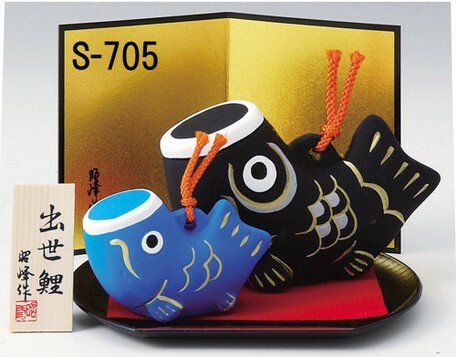 From soil tin of cute carp, it offers a wide wide range of warrior ornaments and helmet ornament. Solemn atmosphere of the Boys' Festival also can produce, also increased pleasure the customer choose. ★ Because inventory is constantly changing, even if you order you may not be able to delivery by the sold out, and the like. ★ usually shipped in about one week after receipt of order, but if you ship with lack of etc. is delayed we will contact the delivery date. ★ If you can not ship within 10 days after your order, we will temporarily be canceled on Contact. ★ If you are left order as the remaining (reservation) is, postage, etc. are separately required to ship at a later date. ★ there is no order column item is, I am sorry now sold out the end. ★ on the nature of pottery, there may be a slight difference between the image in color and size is caused by the firing.